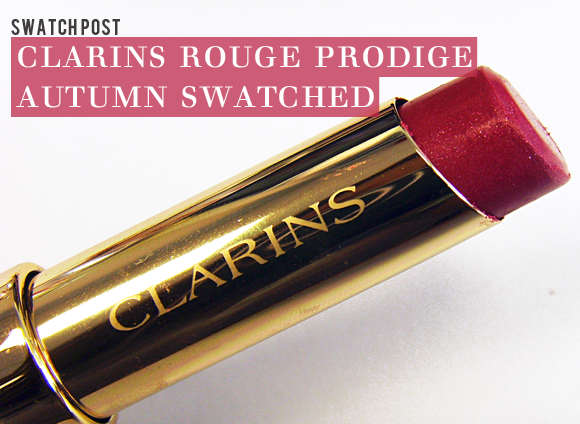 Clarins are launching four new shades of the sumptuous Rouge Prodige Lipstick, a highly nourishing and long-lasting formula. Made up of botanical waxes, plant oils and high fidelity pearl polymers, the colour goes on smooth, vibrant and moisturising – and stays that way! The new shades are perfectly autumnal and compliment the smokey shades of the new Clarins Ombre Minerale Eyeshadow wonderfully. Packaged in the classic pale gold slimline tube, they’re a seasonal staple. 132 Spiced Orange is a bright rosy brown with a touch of orange and red. 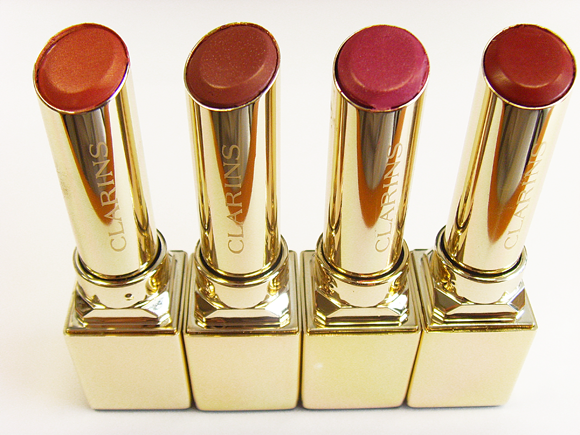 The rosiness and the creamy, slightly pearlised finish makes it a surprisingly easy colour to wear. 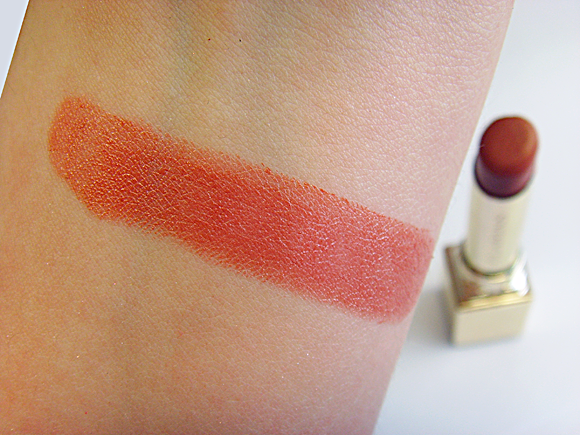 133 Fig is a rosy beige shot through with silver shimmer. The neutral colour is ideal for those who favour a ‘my lips but better’ look, which the added shine is very flattering. 134 Orchid Pink is a fuchsia pink-purple with pink and silver shimmer. It’s the most vivid colour of the collection, and instantly brightens the complexion. 135 Dark Cherry is a deep red wine colour with a slightly matte yet creamy finish. It’s the ideal colour to wear on crisp autumn evenings and nights out. 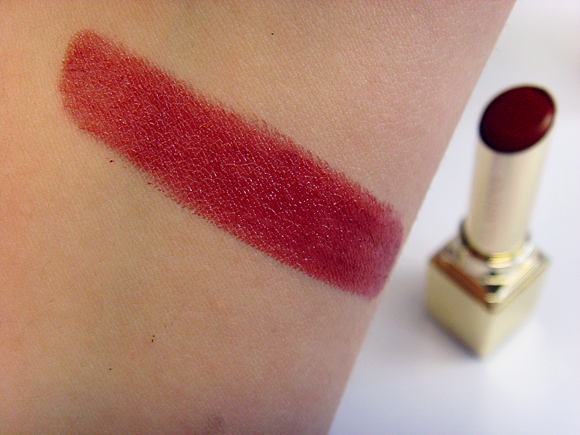 A beautiful silky smooth lipstick that glides on and stays put! It makes your lips feel soft and look fabulous. Creamy Toffee is a wearable shade that will suit most colouring. 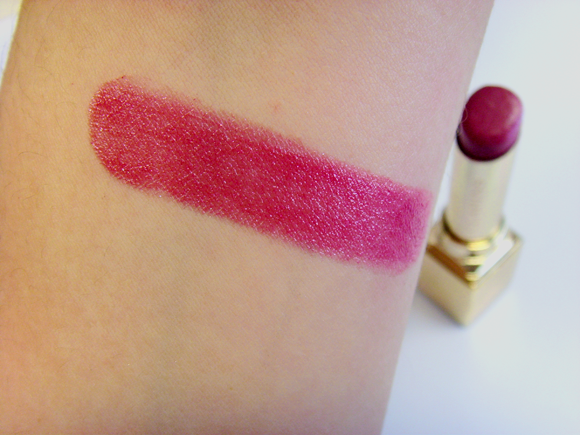 An elegant and affordable lipstick! 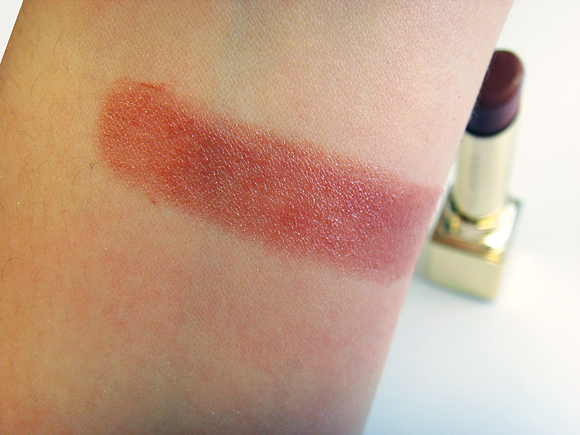 This entry was posted on Wednesday, August 8th, 2012 at 9:00 am and is filed under Make-up, Swatches, Tried & Tested. You can follow any responses to this entry through the RSS 2.0 feed. You can skip to the end and leave a response. Pinging is currently not allowed. I bought the Dark Cherry colour and I absolutely love it. It’s perfect for day or night.